Published: Sep 24, 2009 to ? If you’re family has a history of high blood pressure, please consult a doctor before considering reading this manga. Warning: Reading the manga can lead to severe side effects. From excessive grinning and smiling to moe heart attacks to uncontrollable blurts of “awwwww.” If you are willing to take these risks, then by all means, read Gakuen Babysitters. The story is sweeter than any chocolate or ice cream you’ve ever had. Every so often, your heart will stop from the pure adorableness of the manga. I recommend you don’t try to read it one go or you may very well die from a moe heart attack. There isn’t a single chapter, that won’t put a smile on your face. You get pouts, sparkling eyes, and sometimes they talk like tis to mwake swure you wunderstand how cute thwey are. Despite the fact that you’re reading it in your voice, you just can’t help but hnnngggggg. Do not underestimate the power of love between 5 year olds, their parents, older siblings, and one another. There will be times when your eyes cry rivers. Be it tears of joy or tears of sadness. Prepare a box of tissues beforehand and don’t waste all your tissues during the conflicts. You need to save some for the absolutely heart-warming tear-jerking moments when the problem is resolved. Not all of the cute moments revolve around the kids. There is plenty of high school romance and comedy. Our main female lead is a tsundere, so it is hard not to smile when she turns dere. As for our main protagonist, he is naive & innocent. Dense leads are never fun, well except for this guy. He’s the embodiment of caring and brother-like, so his ignorance of love will only make him better as the person everyone loves. The jokes never fail to make laugh. The comedy comes from the characters’ personalities. It’s not the type of comedy where ridiculous and out of this world stuff happens. The jokes happen, because the characters are who they are. For example, one of the characters solves his problems through violence. No matter who it is, he’ll chop them on the head. It may seem sad, but it’s actually quite funny. We also got a super butler, secretary, ninja...? who sometimes appears out of thin air. The way the characters act on a day to day basis is what creates jokes and funny ones at that. The art isn’t amazing, but you don’t need the skill of Michael Angelo to make cute children. Just make them a little chubby, give them some big eyes, a flushed red cheek and voila, you got yourself an angel. Again, the art isn’t stunning and dazzling, but it’s definitely pleasing to the eyes. The characters are all great. It almost feels like the cast is just one big family. There isn’t a single character I don’t like. Their interactions with one another are simply amusing and delightful to see. Are you perhaps depressed, grief stricken, or just looking for something nice to read? Well, I got good news for you. 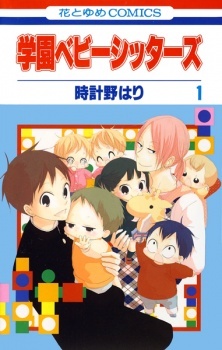 There’s a manga known as Gakuen Babysitters. On a cuteness scale from 1 to 10, it’d be well over 9000. If this manga can’t brighten up your day, then I don’t know what can. There is just something quite compelling about this manga.I cant quite put my finger on it why that's true ,but it draws you in and leaves you wanting more. The story is a pretty basic one , of two orphaned brothers and how the older one is roped in to be in charge of the ' baby sitting creche' in his free hours in exchange for food, board & schooling. It deals with his experiences and the experiences of unique group children and characters .There however lies its strength and biggest impact. so if your looking for a really feel good read , you couldn't ask for a better manga. This manga is filled with laughs and 'aww' making moments. Every time you see the little kids have fun adventures with everybody at the Babysitting Club, you just want to jump in there and go along with the ride. Cute toddlers, good-looking teenagers that are affiliated with them, and the heartwarming stories are a must-have. In short: this is a HAPPY manga. It's cute, funny and has its own little surprises. It's got a simple, slice-of-life storyline that shows everyday happenings and gags. The overall plot is a bit sketchy and yet still to the point. A positive point is the background of the characters; their story is quickly summarized and immediately the adventures begin. But little tidbits are given as the story continues. The story is centred around the little toddlers but includes the protagonist's school life and other events to switch things up. Hints of other genres so far include parodies and romance, but nothing too distracting. The main characters' personalities match each other perfectly. The older brother may be a little soft and too loving, but it's it's the responsibility and care that he's picked up from being the firstborn. Earlier on, I was concerned about him making friends with such character..I thought he might get bullied! Thankfully, nothing like that ever happened - he's adorable. And aloof. But it's funny. The younger is obviously carefree, but he's also cooperative and understands his big brother. They make a great pair and their good relationship is evident throughout the story. The toddler attitude is portrayed pretty well, and each have their own personalities. This could be just me, but I find that it comes out a little too strong sometimes. These guys are just 3-4 aren't they? At some points they seem to act more like kids than toddlers (the things they do;;). ART! Such a story is more likely towards a shoujo audience; everything is appealing. The cute toddlers, diverse students, young parents, even the comedic obaa-chan and butler pair are very well drawn. I am satisfied. I guess I'll rewrite/add to this once the manga's over. I really like it! But I could just be overreacting.